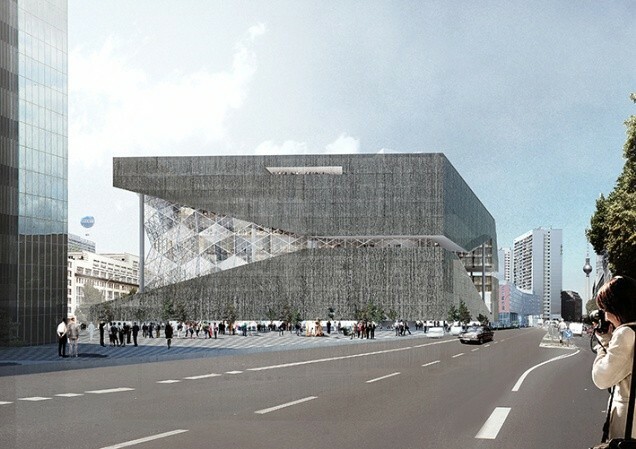 New image of design by OMA for a new building in Berlin for Publisher Axel Springer. 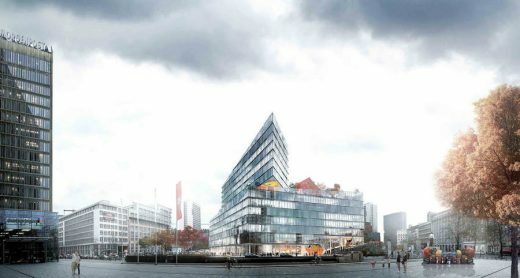 The office, which is located on the site of the former Linden park, opposite the existing Axel Springer HQ, will be able to accommodate 3,500 employees when complete and features a 30m-high atrium with 3D façade elements running diagonally through the center of the building, reports Building Design today. 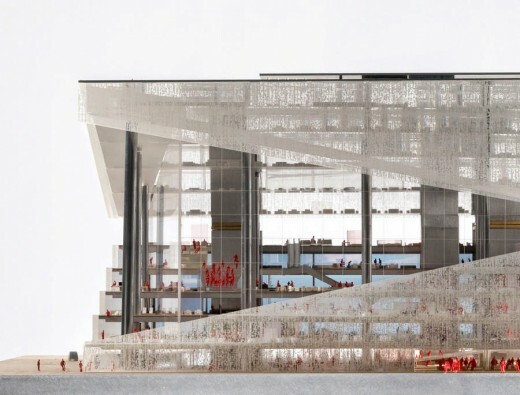 Berlin, 28 March 2014 – OMA’s design for Axel Springer’s new media centre in Berlin has been chosen as the winner in the final round of a public design competition. 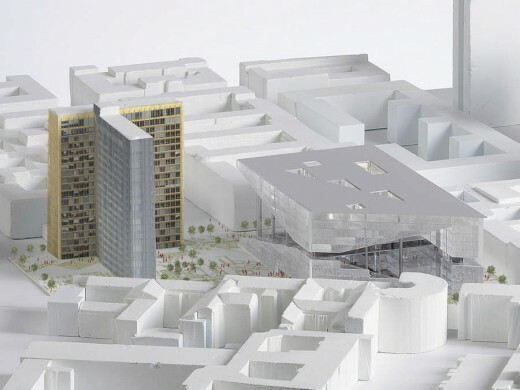 The building will embody Axel Springer’s corporate shift from print to digital media, and will create a new hub in the existing Axel Springer campus in central Berlin. 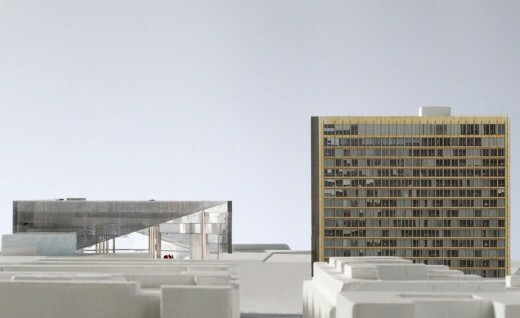 Opposite the existing Axel Springer headquarters on Zimmerstrasse, a street which previously separated East and West Berlin, the building will be situated at one of the city’s most significant locations. The new office block is bisected by a diagonal atrium that opens up to the existing Springer buildings — an extension of the Springer campus. The essence of the proposal is a series of terraced floors that together form a ‘valley’. Each floor contains a covered part for formal work, which is then uncovered on the terraces to act as an informal stage and a place to broadcast ideas to other parts of the company. The ground floor is open to the city and contains studios, event and exhibition spaces, canteens and restaurants. 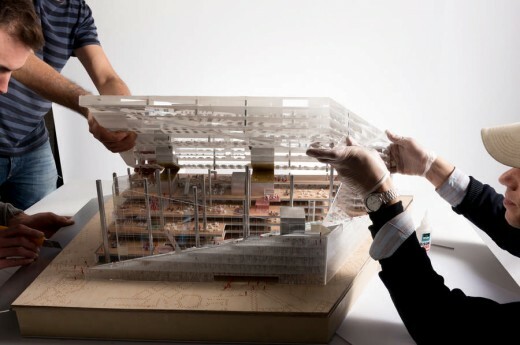 OMA’s design team is led by partners-in-charge Rem Koolhaas and Ellen van Loon, and project leaders Katrin Betschinger, Alain Fouraux and Betty Ng. 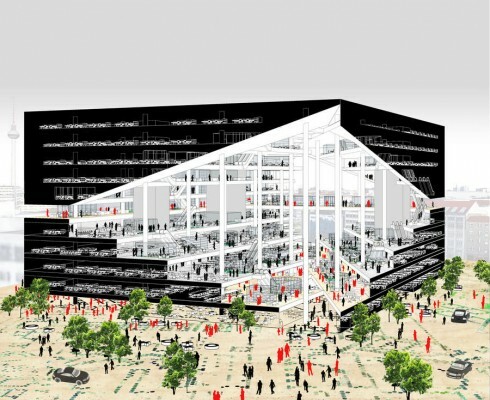 18 December 2013, Rotterdam – OMA has been announced as a finalist in the competition to design Axel Springer’s new Media Campus in Berlin. 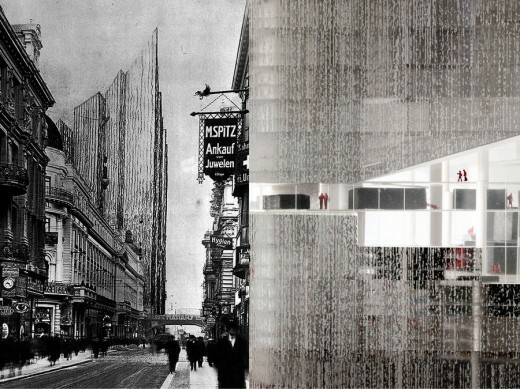 As one of three practices, OMA is entering the final stage of the competition. The winner is due to be announced in the new year following a series of public consultations. 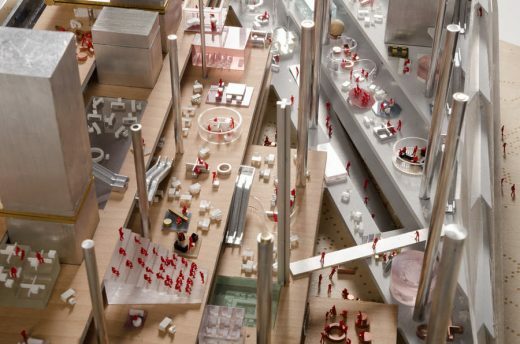 All proposals are currently exhibited at the Deutsche Architektur Zentrum (DAZ). Springer has launched a corporate move from “print” to “digital media” – in which our building will act both as a symbol and a tool; a palace to lure the elite of (Germany’s) digital Bohemia to its compound in Berlin. We therefore propose a building that lavishly broadcasts the work of individuals for shared analysis. The new office block is injected with a central atrium that opens up to the existing Springer buildings – a new center of the Springer campus. The public can experience the building on three levels – ground floor lobby, meeting bridge, and roof-top bar. The meeting bridge is a viewing platform from which the visitors can witness the daily functioning of the company and how it evolves.